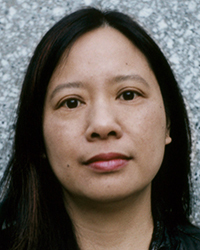 i was surprised to realise recently that, apart from a CD review last year, the penultimate composer in my Lent Series, Liza Lim, has not yet been featured on 5:4. That’s a pretty serious omission, one that i hope will be mitigated by celebrating her 2009 work for solo cello, Invisibility. Too many discussions about new music get distracted by the shedloads of technical tomfoolery encasing the music (frequently as a substitute for content, activity masquerading as achievement). In the case of Invisibility, however, one can only begin by examining a technical aspect of the work—but an aspect that informs the work at every level, from the exotic surface right down to its firmament. Alongside the conventional bow, Lim has also utilised a so-called ‘guiro bow’, from which the hair has been removed and wrapped around it, making a serrated edge which when drawn over the strings causes a constant timbral oscillation between wood and hair. Used in the context of Invisibility, it creates an intensely tactile sonic texture, exposing (or at least hinting at) the mechanics of the player’s actions. But more than this, particularly in the first half of the piece, the resultant material often sounds as though it has lost all contact with the kind of grounded familiarity established in umpteen cello works that have preceded it. Articulated via the guiro bow, Lim’s cello skitters and glides over strange harmonics, rendered as half-speaking sighs and squeals, inhabiting a kind of limbo between utterance and noise. The same can be said of this material’s registral opposite, deep growls and grindings that are just as ambiguous. It takes time to become oriented to this mode of expression, even more so when Lim introduces increasing amounts of space, allowing the instrument to be a slow, pensive entity, unafraid of silence. As it continues, the penny finally drops: this is not what it at first appears to be, melody audible beneath layers of articulation that cake and distort it. On the contrary, the very nature of performance has here become multifaceted in an entirely new way, and melody—or the perception of something akin to it— is just one ‘artefact’ amidst many others that arise from the act of playing. Lim pushes this to extremes, teasing out the most exquisitely tiny of sounds alongside aggressive, driving momentum, the latter of which ultimately takes over. The culmination of all this is disarming in terms of both clarity and simplicity; a series of intervals—embellished with overtones and noises from the bow—passes into a graceful coda with an inhibited kind of lyrical intent, as though one foot was pinned to the floor. Strange indeed, but imbued with a rarified form of beauty. This performance was given by the marvel who is Séverine Ballon at the 2011 City of London Festival. Broadcast in August that year, not only is it a superb rendition of the piece (from memory! ), but the cello is very close-miced, bringing vivid clarity to the music’s unique tactility. The ‘invisibility’ of the title of the piece is not about silence, for the work is full of sounds. Rather, I am working with an idea of the invisible or latent forces of the physical set-up of the instrument. What emerges as the instrument is sounded in various increasingly rhythmicized ways is a landscape of unpredictable nicks and ruptures as different layers of action flow across each other. The composition also works with magnifications of these disruptions by intensifying various paradoxical combinations, e.g. playing a string that is lightly touched at a non-harmonic node so that the string vibrates in highly complex ways producing a multiphonic effect. The string doesn’t settle in any one vibrational zone but flicks or flickers (shimmers) between states so that what results is an unpredictable array of different noises and harmonics. The two kinds of bow used in the piece offer different possibilities of friction, for instance, the stop/start structure of the serrated bow adds an uneven granular layer of articulation over every sound. Like the cross-hatched designs or dotting effects of Aboriginal art, the bow creates a highly mobile sonic surface through which one can hear the outlines of other kinds of movements and shapes. Moving rapidly between places of relative stability and instability in terms of how the cello is sounded, the piece shows patterns of contraction and expansion, accumulation and dissipation, aligning with forces that are at work within the instrument-performer complex.